A new study from Cornell University, co-authored by Project ICP researcher Jason Gibbs (Michigan State University), finds that apple pollination in New York orchards is more related to diversity of wild bee communities than the abundance of honey bees. 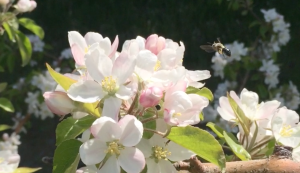 The authors observed and collected pollinators and measured seed set and pollen limitation in commercial apple orchards in western New York state. Seed set increased and pollen limitation decreased with increasing wild bee species richness, functional group diversity (based on nesting, sociality, and size traits), and abundance, but not with honey bee abundance. The original article, published in Agriculture, Ecosystems, & Environment, can be found here: http://www.sciencedirect.com.ezproxy.uvm.edu/science/article/pii/S0167880916300020.